In his book, Guilty Men: Brexit Edition, reviewed here by Tim Oliver, Cato the Younger argues that Brexit is as big and as dangerous a mistake as that of appeasement in the 1930s. Taking up the pen of his great grandfather, whose 1940 book of the same name destroyed the reputations of those responsible for appeasement, Cato the Younger is no less damning of the men and women guilty of leaving Brexit Britain in such a dangerous state of affairs. Guilty Men: Brexit Edition. Cato the Younger. Biteback. 2017. Brexit is so important and fascinating because it may turn out to be one of those critical junctures historians look back on as a moment when the destiny of the United Kingdom changed irrevocably. Such junctures in the histories of countries are usually the result of defeat in war or revolution, meaning the democratic nature of the British peoples’ choice makes it even more fascinating. For Cato the Younger, the last time Britain faced such a dangerous critical juncture was when it risked defeat at the hands of the Nazis in 1940. The struggle to survive in the face of the Nazi Blitzkrieg, the collapse of France and the near-disaster of Dunkirk left the British people in search of men to blame. The 1940 polemic Guilty Men gave them fifteen men whose pursuit of appeasement had brought Britain, its empire and the free world to the edge of defeat. The author, ‘Cato’, was, in fact, three journalists: Michael Foot (Labour), Frank Owen (Liberal) and Peter Howard (Conservative). Those it targeted found their reputations ruined for a generation, some never recovering at all. The book was, however, cathartic. As the front cover of the 2017 book reminds us, as Winston Churchill put it: ‘The use of recriminating about the past is to enforce effective action at the present.’ Charging and condemning fifteen guilty men might have added little physically to the war effort, but it drew a line under a period in British government and politics that had so nearly ended in total disaster. 77 years later, Cato’s great grandson has felt the need to take up his pen to damn those who have left Britain facing a challenge unseen since those dark days of 1940. As the uncertainty of Brexit unfolds, the British people deserve to know who got them into a situation that could take several generations to fix. Cato puts forward a list of fifteen guilty men who are in fact thirteen men and two women, eleven of whom are British and four from elsewhere in Europe: M. Francois Mitterrand, Herr Helmut Kohl, Baroness Margaret Thatcher, Lord Norman Tebbit, Mr Paul Dacre, Mr Rupert Murdoch, Mr Anthony Blair, Mr Jean-Claude Juncker, Mr Nigel Farage, Mr David Cameron, Frau Angela Merkel, Mr Aaron Banks, Mr Dominic Cummings, Mr Boris Johnson and Mr Jeremy Corbyn. Each of them are found guilty of one or more of the five sins of deceit, distortion, personal gain, failures of leadership and gloating, hubris and frivolity. It is inevitable, however, that if and when the downsides of Britain’s departure begin seriously to materialise, the hardened high-priests of Brexit will seek to blame Remain figures in the UK and abroad for negative results. They will never question their own actions, or admit personal responsibility. They are the guiltiest of all. Some might baulk at the comparison with 1940, noting the damage then was a matter of life and death. But Cato doesn’t shy away from the comparison. He notes that, while the issues in 2016 are not as clear as they were when Britain fought for its survival, the examples of delusional thinking, risk taking and a lack of preparation are comparable. In fact, historians have been kinder to the fifteen guilty men of 1940, noting that appeasement did buy valuable time for Britain to prepare for war. History may not be so kind to their 2016 counterparts who didn’t plan for a Leave vote and after it had happened too often adopted a total pig-headed unwillingness to look facts in the face. As both pro-Europeans and some Eurosceptics have long argued, Brexit will be a long and difficult process. The 2016 generation have also been more delusional about Britain’s power than their 1940s counterparts, believing that if Britain could stand alone in 1940, then it could equal this in 2016. In 1940 Britain was indeed the last lonely holdout in Western Europe. But it held on with the backing of its empire, allies from around the world, and thanks to their evacuation, London had become the home to a mini-European Union of free European governments. Britain’s finest hour was not one when it stood alone, but when it led a wider union of states and peoples. Nor do leaders from elsewhere in Europe escape blame. More than anything else, their cack-handed introduction of the single currency caused the problems the EU continues to grapple with, and which played a powerful part in leaving so many Britons repelled at the idea of their country remaining a member state. That Britons are not alone in feeling a sense of disenchantment at the EU reflects a wider failure of Europe’s leaders who ‘have often been too poor in quality, insufficient to the task of defining a role for those nations which never wanted to be at the heart of the EU, but who wanted to be part of the EU’. Recent decades of Europe integration have seen many ‘big ideas, but few big people’. The Brussels they created was introspective, self-regarding and arrogant, where promotion was based on ‘extolling the virtues of greater European unification rather than speaking of the need for securing the willing agreement of national leaders and populations across the EU’. No. The believer compromises the integrity of his campaign when he adopts methods that involve deceits or distortions in pursuit of what he thinks is the greater good, or evoking and exploiting the darker side of human nature. But does anyone care now? As Farage’s Brexit partner and another of the other Guilty Men, Arron Banks said, when pressed on alleged irregularities in the Leave campaign’s spending: ‘We pushed the boundary of everything, right to the edge […] no one cares!’ For Cato the Younger, we should be disgusted with these men who think they can get away with such lying and openly boast about it. 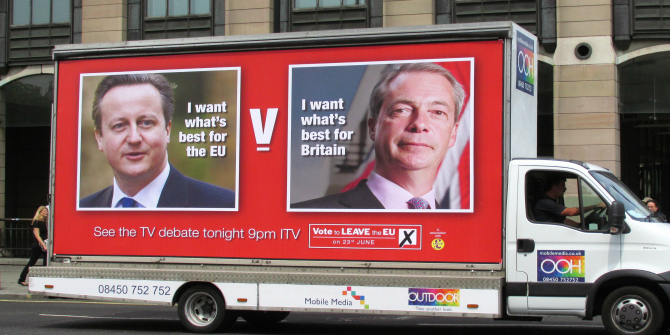 No political campaign is completely honest, of course, but the Leave side put distortion at the centre of its entire strategy. Remain had some very bad moments, most connected with Osborne’s threat of a ‘punishment budget’. But in general its wrong calls were speculative predictions of instant economic meltdown rather than verifiably fact-free claims such as those peddled by Vote Leave. This is a fair point but serves as a reminder of how, as a polemic, the book does have some weaknesses. Despite the short list of guilty men and other members of the cast, Brexit is the result of the decisions of so many people that it is difficult to know where to begin. The guilty list might, therefore, puzzle some. Theresa May, for example, barely gets a mention despite her abysmal failures of leadership and hubris. It’s likely the book was already with the printers when she called the 2017 general election, but that attempt to boost her own personal position as leader of the Conservative party only adds to her guilt. Cato’s view of the great men of the past is also too rose-tinted. They were not always men who pursued European integration for some noble calling. Often they did so for reasons of national interest and personal ambition. That said, with inspiring leadership in short supply in recent years, it is difficult to dispute Cato’s claim that the guilty men of Brexit are the product of a political ‘regime of little men’. Whether you voted Leave or Remain, it’s difficult not to view Brexit Britain as a country of lions misled by donkeys. Beyond ensuring these guilty donkeys do not evade justice as the Brexshit hits the fan, the book offers little else by way of guidance as to where Britain or the rest of the EU should go next. These weaknesses do not, however, detract from an enjoyable book that can be easily read in an evening, on a flight or by the pool while on holiday. But this is not a book designed to entertain. It is dedicated to Jo Cox MP with all profits going to the foundation established in her name. Her assassination in the final few days of the referendum campaign by a domestic right-wing terrorist screaming ‘Britain first’ is a reminder of how low Brexit has sunk British politics. Could things get worse? How might people react when the lies are revealed, and if the risk doesn’t turn out to have been worth it? The current politics of the USA serve as a reminder that things could deteriorate further and are doing so on the other side of the Atlantic in ways with the potential for far greater consequences than Brexit could ever bring about. 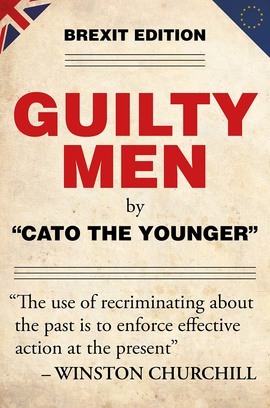 One can only hope the Cato dynasty turns its attention to the men guilty for the dangers now facing the greatest republic since the days of Rome and the ancient Cato family. Surely Guilty Men: Trump Edition is being penned by Cato the Younger’s American cousin? Note: This review is provided by our sister site, LSE Brexit. The article gives the views of the author, not the position of EUROPP – European Politics and Policy or the London School of Economics. Tim Oliver is an Associate at LSE IDEAS, a Teaching Fellow at UCL and Director of Research at Brexit Analytics. I would dispute your characterization of british voters as lions. I live in the republic of Ireland where the UK exit is likely to have the largest impact outside the UK. We have our own issues with EU Bureaucracy but have prospered in the EU. The problem for us may be economic but even greater is the loss of a good friend at the EU negotiating table. We have a big question. 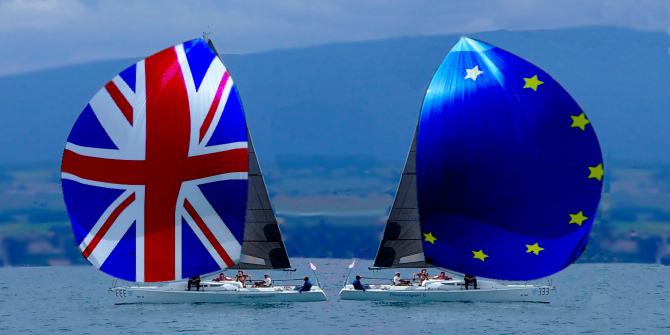 Does Brexit mean Brexit or does it mean UK exit? If Brexit means Brexit what is the future fir Northern Ireland? I think the Brexiteers dont care a fig about one part of the UK. Knowing their form they will tr to make it someone else’s problem. Connor: Unfortunately you are completely correct..
Brexits font care about a hard border with the Republic and that this will mot only cause econic pain and antagonistism but possibly destroy the peace process…Nor do they care if Scotland ends up leaving the UK as a result of Brexit. If the Scots do leave the UK, they will suddenly become ” the others “, part of some supposed European conspiracy to keep the English down. That’s why I reger to Brexits as ” little Englanders “. They claim patriotism and love of country but really only love their fellow Brexits…Most Brexits being white, uneducated, and anti immigrant..